Powder, good food, bathing in natural hot springs and ski adventures in the beautiful woods is what await us on Hokkaido in Japan. Hokkaido is the northern island of Japan, thanks to cold winds from Siberia and northern China, there are incredible amounts of snow every winter. Statistics show that it snows about 15 meters per season. As if that wasn't enough, the last 5 years it has snowed every day throughout the month of January. So pack the goggles and your fat skis and go with us on the powder-chills in Japan. Our goal of the trip is to visit several different ski resorts and pick the best parts at each place. The distances between many of the resorts are pretty short and by staying in three different places we have time to explore ski resorts in different areas. You can ski untracked powder from the lifts each day if you choose the right ski resort each day. But we get so much more out of it if we have the flexibility to hike the peaks surrounding the ski resorts, or hike back from one of the many fine rides that doesn't end at any lift. Therefore, we want everyone in the group to have skis with touring bindings and skins. 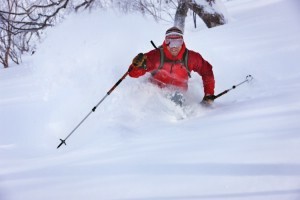 If, however, you are a group who doesn't want to do any ski touring we can customize the trip according to your wishes. Hokkaido is Japan's northernmost island and is reached easiest by 1.5 hour domestic flight from Tokyo, although there is a tunnel to the main island. Hokkaido is two times bigger than the size of Switzerland. Sapporo, the largest city on Hokkaido, is perhaps best known for us skiers thanks to the Winter Olympics 1972. Hokkaido is Japan's main agricultural area. Most of the rice and fish are produced here, as well as the cultivating of vegetables. There are many pristine forests on Hokkaido and the island is the least populated part of Japan, although the number of inhabitants on the island are approximately 5.7 million. There are six national parks and twelve nature reserves and the island is a popular resort for the Japanese, especially in summer. There are a total of over 80 ski resorts on Hokkaido, many of these are small and have lifts that are of no or little interest, but there is still plenty of good skiing. The skiing is generally quite easy, and thanks to all the fine powder snow and modern skis, not so demanding compared to off-piste in the Alps. However, we want you to have experience from skiing off-piste before. What you need to know to be able to hike on skins we can easily teach on the spot, you just need to have the skiing skills. The level of effort and the length of the top rounds, we will completely adapt to the group. The following program describes the trip as a whole. The number of days can be adapted if you book as a whole group. Which resort we go to each day depends on where the snow is good. This day is the date given as date of departure when booking. Arrival at Sapporo, from there we travel by car/minibus to Niseko. We met at 4 pm at Chitose. First ski day and we get to know the powder skiing in Niseko/Hirafu. We explore all the beautiful woods skiing and bowls on all sides of the mountain. During the day, we also learn and practice how to use the avalanche equipment. After skiing, it is a given with a cold beer in the nearby Onsen. Few things can compete against lying in natural hot springs and watch the snow fall after a good day of skiing. Hopefully, the fatigue from the long flight is gone and we can step up the pace a bit. 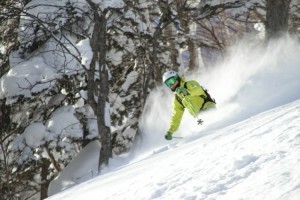 There are many nice resorts close to Niseko and it might be of value to visit one of these today. We continue to Kiroro and we will sleep in Otaru. First day in the area around Furano. The peaks and resorts here are higher and even if the vertical is the same as in Niseko the snow is often drier and the air is colder. Even here there are hot springs and delicious food. What surprised us most in Japan is not only the skiing, but also how wonderful the food is. The potential for off-piste skiing from the lift here is unbelievable. We take the days as they come and adapt to the preferences of the group and the weather. Our seventh and final ski day. After skiing, we will travel to Sapporo, where we have dinner and sleep the last night. For those who want and have the time we recommended to stay a few days in Tokyo on the way home. The following personal equipment you need to have with you, this is not included in the price. Words that we are proud of. So far I have skied with Mountain Guide Travel on three different trips. Two have been in the far North of Sweden and one in Japan. All of them have been fantastic but, and there is always a but, Japan was my true love. The powder is amazing, the tree skiing is an experience that has to be experienced and the people are great. Andreas was a great guide and ensured that we enjoyed ourselves on and off the snow, with hosting skills that matched those of his guiding. Everyone felt included, the team was a team and laughter was one of the main themes….after powder. I just loved skiing in Japan. The powder was ridiculous in both its quantity and lightness, the hikes short, the lack of tracks fantastic and the general fun unmatched. This is without adding in a joys of tree skiing. All at a height that means you are rarely panting and can pretend that you are a lot fitter than you really are. The fact that every person in all the pictures have huge grins says it all. Truly great fun skiing. Having never been to Japan, I just fell in love with the country. Andreas and the Mountain Guide Travel crew know the areas around superbly and were able to bring us to some brilliant Onsens and Restaurants. Not necessarily the flashiest or newest but some of the best, giving you authentic experiences and amazing memories. 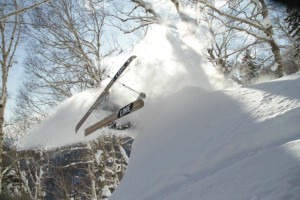 films by Henrik Bonnevier who has been skiing with us in Japan 5 years in a row. Place your booking by clicking on the date. Please use the form if you have any questions or want us to contact you.